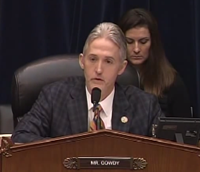 (VIDEO) Trey Gowdy's IRS Smackdown! Yes it may be grandstanding. And yes we often frown on grandstanding. But there is a time when publicly speaking truth to the corrupt and greedy government workers is needed…no REQUIRED! Trey Gowdy rocks it at the House Hearing on the IRS Scandal. To read more articles by Kevin Jackson, check out TheBlackSphere.net.